Estonian Contemporary Art Development Center has launched the website www.kunstiindeks.ee which provides information about transactions made in the Estonian art market as well as general trends in the market to everyone who is interested. A seminar introducing the Estonian Art Index will be held on Wednesday, April 4th at 2pm in the conference room of the Luther Machinery Hall (Vana-Lõuna 39/1). To register please send an e-mail to kadi-ell@ecadc.ee no later than April 3rd. 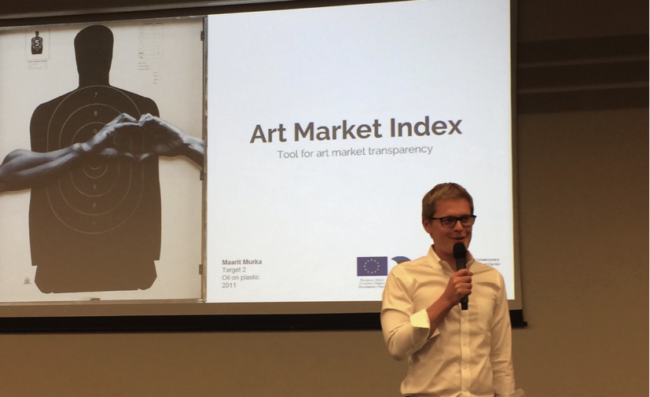 With its ever-expanding database, the Estonian Art Index is the foundation for calculating the art market index, which provides an overview of the art market similar to the way that the the stock market index provides an overview of the stock market. The project was born as a result of cooperation between leading Estonian galleries, Enterprise Estonia, the Estonian Contemporary Art Development Center, and Civitta, the leading management consultancy in the Baltic States. At the time of its launch, the database upon which the index is based on includes more than 5,000 transactions that have taken place in Estonia between 1998 and 2017. This is the largest database of transactions made with Estonian art. To the knowledge of its creators, it is also the largest art market database in both the Baltics and Scandinavia. The database provides an overview of the capacity of the art market, the profitability of the acquisition of Estonian artworks as an investment, and the trends in the art market. “We consider the creation of the Art Index as a database to be extremely important, as the index brings more and more transparency to the market. Particularly, the galleries that contribute to the database with the transaction data should be highlighted, as this is what makes the Estonian index unique,” commented Kadri Laas, Project Manager of the Estonian Contemporary Art Development Center, on the fact that in addition to public auction data, the Art Index also contains information about daily transactions provided by the galleries. Comprehensive and easy-to-find transaction statistics are a good tool for everyone involved in the art market. The database allows art as an asset to be considered on an equal level with other assets (e.g., stocks, real estate, etc. ), for which consistent overviews are being published. “The publishing of art market indexes is not unique in the world and there are several well-known global index sites (e.g. Artprice, Artnet and Art Market Research). Locally-focused indexes are also not that rare. Unfortunately, until now, there hasn’t been such initiative in Estonia and art lovers have been left to guess what is the volume of transactions being made on the market, what are the price levels and what could be the profitability of an investment portfolio made up of art works”, says one of the initiators of the project, technology investor and one of the founders of Civitta, Riivo Anton. The project for creating the Estonian Art Index is supported by the European Regional Development Fund. The theoretical basis for calculating the index is based on Riivo Anton’s master’s thesis “The rate of return on art investments: the case of Estonia”. Collecting and analysing the data for calculating the index was coordinated by Civitta Estonia Ltd.